You have worked hard to plan your menu for the week, prepare dishes that were easy and on the table fast, and then it all falls apart in one day! You have a day, and we have all had them, where nothing goes right. You didn’t thaw out the meat you needed, you got busy with unexpected things like a sick child or unexpected meeting, and you whole menu is thrown in to chaos! I have to admit, this happens often at my house due to my health issues. I could wake up one morning feeling good and start out my day with all good intentions and then something starts to hurt or fatigue hits me like a mack truck and dinner is the last thing on my mind. How do I keep from ordering pizza or having the husband pick up fast food on the way home? I keep back up meals that are simple to whip up and get on the table – simple enough even the husband can help out if need be. What do I mean by back up meals? Well, that has several meanings in my house. In the winter, I keep extra servings of chili and soup in the freezer that can be thawed out easily in a saucepan on the stove. In the warmer months, I keep hot dog buns in the freezer as well as nitrite free turkey dogs. I keep shredded chicken in the freezer as well to quickly make quesadillas or fajitas along with some cut up onions and green bell peppers. Cream cheese (I use this to make some Alfredo sauce up real quick and throw some shredded chicken and it’s a quick meal). I keep taco seasoning made up and on hand for quick tacos. With some planning ahead of time, you can have several “go to” back up meals with the ingredients in the pantry or in the freezer just for those times when it all goes to heck and you have no way to get the dinner you had planned on the table that day. I have to say, it has made a huge difference to keeping us from spending money on fast food, take out, or pizza by just having some things on hand and a few quick meals that I can go to when I need it. 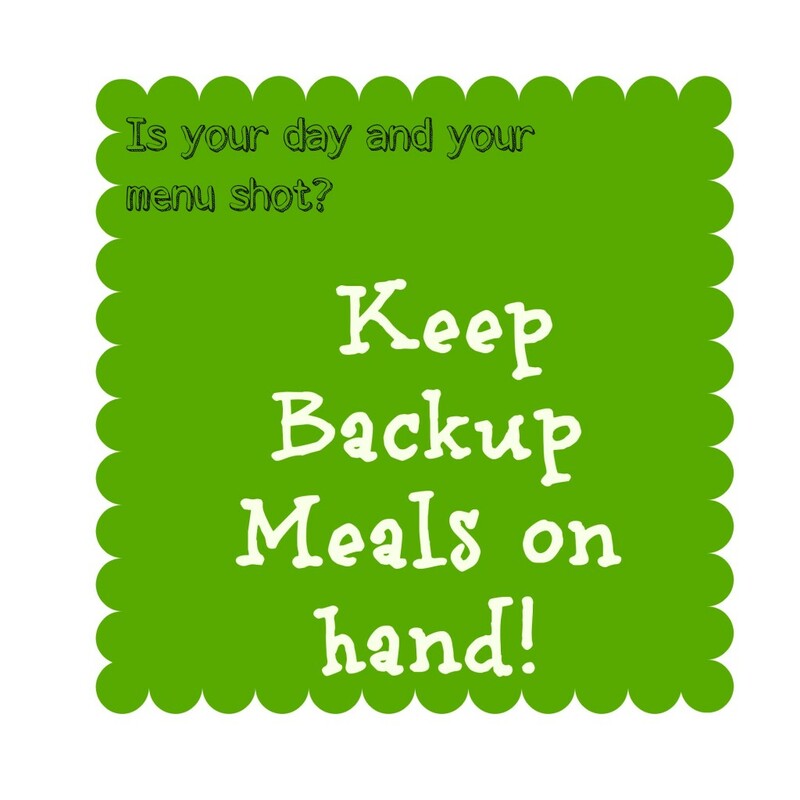 What are some of your backup meals or tips to get dinner on the table when it all goes to heck? I seldom follow my menu plans. Something always seems to come up. My backup meals include frozen pizza (which we actually ended up having last night), taco meat in the freezer, roast meat for sandwiches in the freezer, and breakfast options. Frozen pizza works. We sometimes make them on english muffins when I have those in the freezer. I also keep some homemade pizza sauce in the freezer for when I’m in a pizza mood! Thank you for stopping by! I’m always trying to keep a few extras around if for no other reason it is less I have to do next week in my weekly planning. One meal that is good for a couple of weeks is fish tacos, (frozen fish, tortillas, sour cream & lime juice and finely shredded coleslaw) The coleslaw is the first to go bad but that won’t happen too fast. I do like your shredded chicken idea. I keep frozen boneless skinless in the freezer but never thought about cooked shredded. Great idea. Thank you for sharing the idea Patti for the fish tacos. That sounds like a great one to add to the list! I love your idea of keeping shredded chicken in the freezer. Our favorite easy cheap go-to meal is turkey burgers with rice. I also try to keep a pork tenderloin on-hand. Though it does take 45 minutes to cook, which can try your patience when everyone is “starving.” I serve it with a frozen vegetable and don’t judge me – imitation potatoes. Thank you for stopping by and keeping shredded chicken is a life saver in our house! Turkey burgers sound good. I keep turkey dogs that are nitrite free and we use those a lot for quick lunches when sandwiches won’t do. Pork can take awhile to fix in the oven, but I’ve found it’s faster on the grill if you get it thawed out first. I have some great marinades I use on the grill for pork, especially Jack Daniels Pork tenderloin – yummy! Such great ideas. I really need to start doing this. I used to keep browned turkey and beef in the freezer and it made weeknight meals so easy. Thanks for the inspiration to get back in the habit. Thank you and thank you for stopping by. It really does make a difference to have some things on hand to get dinner on the table fast. Good luck with getting back in the habit and let me know how it goes. Philly steaks, fish stick or frozen fish for tacos and yes, we always have some kind of easy to assemble pizza on hand (use tortillas, english muffins, bagels, french bread or good ole’ frozen). It’s always good to have backup and easy to prep meals on hand. Thanks for sharing with #smallvictoriessunday. I’ve never used cream cheese for alfredo sauce, do you have a trusted recipe you use? Snack night sounds fun! Sometimes we wind up doing that when our schedule gets thrown off by eating lunch late. Love just grabbing a few snacks and not having to really cook! Thank you for stopping by!